*Installation not included. Limited to quantity on hand. Crystal-clear Images with High Definition Display – This LCD display delivers vivid colors with high-contrast and sharpness. Featuring an all-new electrostatic capacitive touch panel and High Definition LCD Panel, with high luminance white LED backlight. Convenient and Easy-to-Use Capacitive Touch Panel – Provides a high contrast ratio, crystal clear display and vivid text. Easy to use widgets provide access to information screens with a swipe. Rich and Immersive High-Resolution Audio – High-Resolution Audio is high-quality sound that exceeds CD standard. High-resolution audio captures and beautifully expresses all the details of your favorite music. Through ultra-high and low frequencies, immerse yourself in a rich and high-quality sonic experience. High Quality Audio Parts Supporting High-Resolution Audio Reproduction – To ensure the best possible sound quality, the receivers use custom-made and carefully selected parts,such as audio quality power supply capacitors, high quality coupling capacitors and cross-shaped panel structures*. These parts are further optimized through meticulous tuning of the component values and circuit paths. Optimal Sound Performance with 13 Band Graphic EQ and Time Alignment – Use the graphic equalizer to tailor the sound quality to your unique tastes. Additional sound staging is available with the Time Alignment feature, designed to provide optimal sound performance. Weblink – Your Portal to Waze, YouTube and More – WebLink is the new way to get the most out of your in-car receiver. 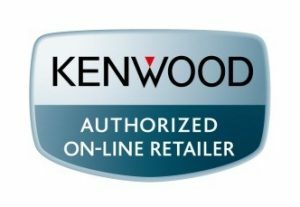 Download the KENWOOD WebLink app and you can connect your smartphone with USB to access some of your favourite apps such as Waze, Youtube and Yelp. Using your apps through the large and clear touchscreen makes WebLink the safest and easiest way to use your smartphone on the road. Wireless Android Auto for Easy Connectivity – Android Auto was designed with safety in mind, helping you to minimize distractions and stay focused on the road. And now you can connect wirelessly, so you can enjoy all of your smartphone’s features without the fuss of any cables. KENWOOD’s multimedia receivers combine Android Auto’s intuitive voice controlled interface, a large touch screen and superior sound quality. Making it the perfect complement for your in-car life. Safe, Smart and Comprehensive Control with Apple CarPlay – CarPlay is the smarter and safer in-vehicle interface to operate your iPhone, and the experience is taken to another level when featured in a KENWOOD multimedia receiver. Simply talk to Siri, or touch the receiver’s display and get directions from Apple Maps, make phone calls, listen to voicemail, send and receive texts, and listen to music all in a way that allows you to stay focused on the road. Pandora/Spotify Ready so You Can Stream Your Favorite Songs from Your Smartphone – Ability to control Pandora and Spotify from your iPhone via USB/Bluetooth or from your Android via Bluetooth to enjoy millions of songs you like. Equipped with the Intuitive KENWOOD Music Mix – Up to 5 Bluetooth® devices can be connected to the head unit at the same time and you can enjoy audio streaming just by switching the devices with your friends or family. Dual Phone Connection Allows You to Operate up to Two Phones Hands-Free – Allows two phones to be connected for hands-free operation at any time. Easily switch between both phones for incoming call. Also includes wide-band hands-free profile ver.1.6 for high quality clear calling. Equipped with Dual USB Ports – Play your music from one USB port and use the other to charge your device, or charge both at the same time. Comes Dash Cam Ready so You Can Drive with Maximum Comfort – Full HD video recording is available in a compact windshield mount that can record every event in front of you while you drive. High Dynamic Range (HDR) allows awless recording regardless of extreme bright light or very dark conditions. With a built-in gyro sensor, if an accident occurs it will be saved in a separate portion of memory within the 8GB SD card for viewing. Additional safety and warning features can be activated to avoid frontal collisions or remind you if traffic has moved in front of you. Enjoy the Many Infotainment Features Available on the iDatalink Maestro RR – When an Automotive Data Solutions iDatalink Maestro RR is connected to a compatible KENWOOD receiver, it provides a seamless interface with factory infotainment features such as Satellite Radio, USB Media Player, Bluetooth hands-free and music streaming. Vehicle information such as HVAC, performance information, and TPMS can also be displayed.